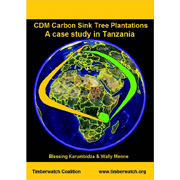 This study dissects a tree plantation carbon sink project at Idete in the Southern Highlands of Tanzania. The Norwegian company that owns the project, Green Resources Ltd, aims to register the project under the CDM (Clean Development Mechanism) so as to be able to generate carbon credits to sell to the Norwegian government. The plantation is already being established, and in the process it will destroy over 6 000 hectares of grassland, reducing community access to grazing, biodiversity resources, water and cropland. The study will describe and discuss the impacts of the project on local communities and the natural environment.